Very easy for Twi beginners to pick up the grammar, very good for Twi speakers to learn how to write Twi. The book is not the best for learning pronounciations (like most language books), readers might need some audio material to accompany it or already have some concept of the sounds in Akan Twi. This is excellent if you use it in the manner for which it was prepared. As the author states, this is not a self study book. One needs to associate with those who speak this language. Using this book, along with a native speaker teacher, one will learn the language rather quickly. It is perhaps unkind to criticise this work as being a very poor choice for someone wishing to learn Twi by themselves, when the book itself says: "This book is written for Beginner and for early Intermediate level learners. The instructor must be either a native Akuapem Twi speaker, or a near native Akuapem Twi speaker. The text is therefore not meant to be a 'teach yourself' book." Unfortunately, I had no way of knowing this when I bought the book, and only realised when it was too late to return it. If you are lucky enough to be able to attend a course where this is the required text (which I imagine would not be the case for most people searching for a book on Twi through Amazon), then I am sure that Ma Yensua Twi would rate an unqualified 5 stars. With its delightful illustrations, it is the most beautifully presented language book I have ever seen. It is also, obviously, a very well thought out course, combining grammar; reading; dictation; translation; word substitution and other exercises. 1. If you have no existing knowledge of Twi, and you are trying to learn the language on your own, you NEED a course that comes with tapes. Even armed with a good written guide to pronunciation (which this book does have), some Twi sounds are extraordinarily difficult to master, having no phonetic equivalent in English. And even if you are able to get the sound of a word right, the chances are you will get the stress wrong or, worse still, the tones (combinations of high, mid or low; long or short) which can change the meaning of a word completely. For example, words that initially all sound quite similar to "papa" (at least to a bloke from south London) can mean any of: father; good; to pat; a fan. 2. 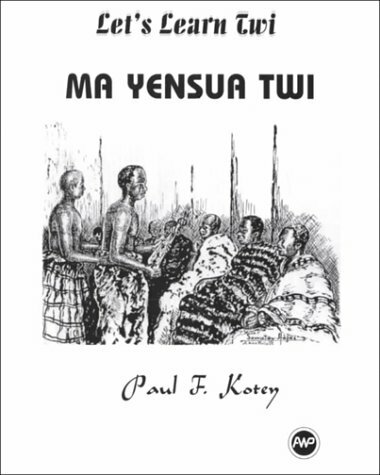 Virtually all of the exercises in Ma Yensua Twi are, by their very design, of no use outside their intended context of live tuition: many of the reading exercises have no English translations; there are no answers to the translation exercises; the dictation exercises are simply "Instructor selects Akuapem Twi Words, Phrases, and Sentences covered to date for this exercise"; and some of the exercises involve improvised group role play. 3. In the 25 chapters in which Ma Yensua Twi covers a wide variety of social and cultural situations, extensive vocabulary is introduced and grammatical points are explained in a clear style. This is really the only area where Ma Yensua Twi is of any use at all to someone who is unable to use the book as part of a taught course. But, as a supplement to other Twi resources, Ma Yensua Twi may be more confusing than helpful. This is because, unlike the other Twi materials that I have been able to get hold of, Ma Yensua Twi is a course in Akuapim (Akuapem), rather than (by far the more widely spoken) Ashanti (Asante) Twi. (As far as I am aware, nothing is easy to come by that covers Fanti (Fante/Mfantse) Twi.) Although I have heard that Akuapim Twi is often regarded as the prestige Twi dialect, and indeed, that all dialects of Twi are mutually intelligible, the fact remains that when you are learning the language and are not an experienced speaker (as I am not), it only makes the task more difficult if you are giving yourself the additional headache of trying to master differences between dialects. To illustrate the point (and perhaps this is an extreme example), "Yefere no sen?" in Ashanti, meaning "What is it called? ", is "Wu din de den?" in Akuapim Twi. Enough said. Please let me be clear (and partly to assuage my guilt for having given this book a one-star rating) that I am not saying this is a bad book per se. I think if you are able to attend classes where an appropriate instructor follows this course, or if you have the resources available for private tuition, then Ma Yensua Twi would be an excellent learning tool. If, however, you are unable to do either of these, then don't bother buying it.